Safety bracelet (limb restrainer): a novel innovative device, for patient care in pre-hospital or hospital stay phase. A limb restrainer is a device physical or mechanical device. It is intended for medical use, which is intended to limit a patient’s movement to the desired extent necessary for medical examination, treatment or safety concern of the patient during treatment inside the hospital or pre-hospital care. Authors report an new device “limb restrainer” whose need was felt for long times, specially for patients immobilization during intensive care treatment and transportation, while patient was kept endotracheal tube, Ryles tube, Foleys catheter central venous pressure line, and even external ventricular drain and drain at surgical sites occasionally, necessitated care of tubes not only difficult but was critical for patient care and continuation of treatment as these tube were always on verge of pulled out with its consequent. It can also be called safety bracelet, which is economical and highly convenient in uses and also providing patients comfort. We have used for two years without skin abrasion or ease of use by nursing staff along with patient satisfaction. Limb restrainer, Patient care, Skin abrasion, Environment. A limb restrainer is a physical or mechanical device used for medical purposes to limit a patient’s movement to the desired extent, which is extremely necessary for examination, treatment or safety concern of the patient. Limb restrainer is applied to legs or arms of patients. The application of limb restraints on both legs and arms once is occasionally required as an essential part to provide conducible environment for patient acre including positioning, administration of drug or therapeutic procedure is also called as a four point restraint procedure. A properly restrained limb is prevented from producing any type of movement . The major purpose of applying a limb restrainer device is protection and safety the sick cases and includes the patient’s position stabilize to prevent self-harm or neighbor patient, promoting continuation of the therapeutic intervention and promotion of feeling of personal security to the patients who require it [1,2]. Most commonly restraining devices are used to protect the patient who is at risk for injury to themselves including fall, positioning and protecting the patient during treatments and to maintain ongoing care i.e., intravenous therapy, ventilatory support through endotracheal tube, nasogastric tube for feeding. Rarely for agitated and combative patients to protect themselves and others [1-3]. Limb restraints are used to deal combative or irritated, unconscious patients trying to utilize their arms or legs to strike at another patient or hits at care giving paramedical nursing staff or hinders therapeutic procedure, which is essential part of health care or pull out important lifesaving apparatus and equipment’s or tries to pull out central venous canula, Ryle’s tubes, Foleys catheter, ECG electrodes from their r body, Arm restraints application is also necessary exercise while patient is advise to be nursed in lateral or prone position [3,4]. The safely bracelet can be classified into mechanical, chemical or environmental. The mechanical or physical: A devices can utilize a variety of materials i.e., mesh leather or web belting. The various types are cloth wrist, mitten restraints, and ankle restraints. The physical restraint may involve application of limb restrainer applied at [a] wrist, ankle, or waist restraint [b] tucking in a sheet very tightly and restraining movement of patient [c]. Use of an enclosure bed [d]. By putting all side rails upward to avoid patient from getting out of treatment cot. . The chemical method: It includes various as hypnotics and tranquilizers medications used to calm behaviour. Chemical restraint involves use of a medication to restrict movement or behavior of a patient, where the drug or its dosage used is not an approved standard health care. Environmental restraint: Includes provision of side rails on patient’s beds, locking devices on wheeled equipment and locked up psychiatric units. [1,2]. It is composed of limb cuff and two straps (Figure 1). Limb cuff is wrapped around forearm, as it has foam covered with soft cloth does not produce skin abrasion (Figure 2). Straps are used to immobilize forearm and can be safely tied to sides of bed frame with Velcro, permitting immediate release without need to tie a not with almost instantaneous release if emergency situation warrant. 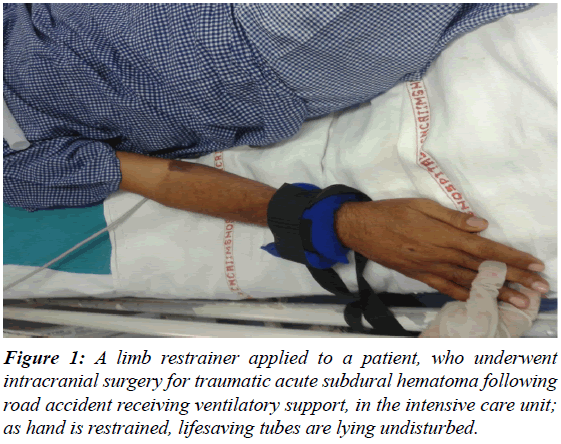 Figure 1: A limb restrainer applied to a patient, who underwent intracranial surgery for traumatic acute subdural hematoma following road accident receiving ventilatory support, in the intensive care unit; as hand is restrained, lifesaving tubes are lying undisturbed. Figure 2: Component of limb restrainer. The use of restraints is possesses an emotional issue on the part of the family .patient and staff. The caregiver has the ethical and legal responsibility to keep patient safe. The decision to restrain and duration is dictated by need and decided jointly by physician and nursing staff. It is suggested use of restraints should be minimized and safe alternatives methods should be tried [1,2]. Various guidelines are issued by various regulating authorities in different countries, regarding safe application of medical restrainers that it should be used for only for patient safety not for convenience of the caregiver paramedical staff or relatives at domestic care. The restrainer applied with care to avoid discomfort or damage of limbs of the patients. Repeatedly assessment should be carried out every two hourly for further requirement or continuation, assess impact over skin at the site of application, circulation of the area i e signs of ischaemia pallor, pulse-less, pale and cold limbs, absence of capillary refilling, providing full range of movement of restrained limb and change the position of the patient and ensure proper body position. Preferably the safety bracelet should be tied to the bed frame. It should never be knotted and ensure a quick release tie mechanism if required during emergency [2,3]. Following brief procedure are usually not considered as parts of restraint i.e., devices used to temporarily immobilize a patient during a diagnostic procedure like X-ray, supportive devices applied for fractured patient in the orthopaedic ward and protective equipment as age-appropriate support like cribs . Limb restraints are essential part of patient care to avoid iatrogenic injury to the patients themselves or neighbour patient or occasionally health care provider staff. However , brief procedure i e devices used to temporarily immobilize a patient during a diagnostic procedure like X-ray, supportive devices applied for fractured patient in the orthopaedic ward and protective equipment as age-appropriate support like cribs are usually not considered as parts of restraint procedure. However constant vigilance is required regarding necessity precaution during usage and further need off continuation and psychological and social, economic issue must be given due consideration. Riley ML. The effect of an arm restrainer on involuntary movements. Am J Occup Ther. 1970;24(2):116-8. Loon HE, Cohen P. An arm restrainer for the athetoid. Am J Occup Ther. 1954;8(5):204-6.